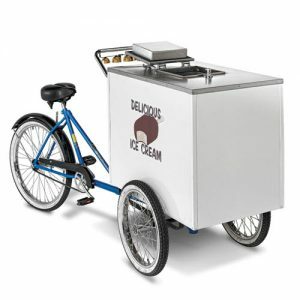 Our V IT Ice Cream Tricycle is a Classic vending trike with large 20″ x 20″ flip top door. Pedal your way to profits! Same as models V-ICT and V-IT-S except the Door is a large removable flip style door measuring 20″ x 20″. 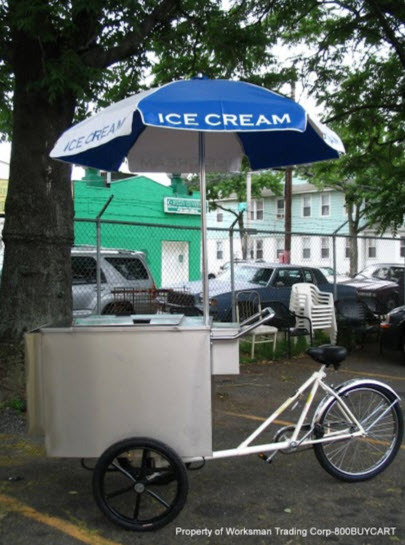 This model is most often used for scooping Italian Ices or Ice Cream. Also great for bottled beverage sales. Includes a Napkin/storage compartment by handlebars. The Model V-IT does not include a dry ice shelf. Holds approximately 12 2.5 gallon tubes (6 over 6). Ships via common carrier truck, additional freight charges apply. 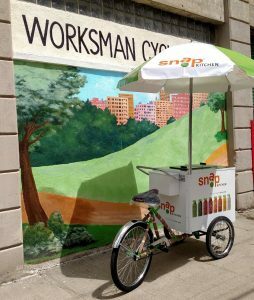 Another Worksman Cycles/800 Buy Cart American Classic popular with local street vendors and corporations.